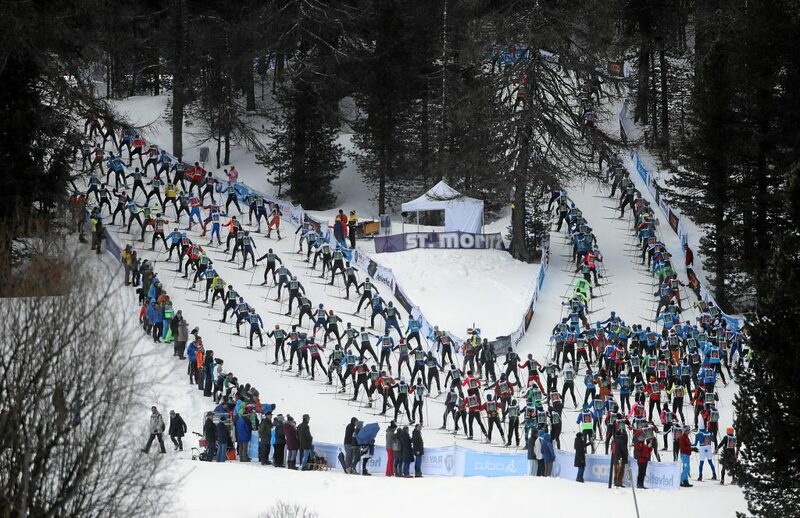 The 51st Engadin Skimarathon again offers the best cross-country skiing in Switzerland and a field of top international skiers. Dario Cologna and Roman Furger among the men and Anouk Faivre-Picon among the women can win the Engadiner for the fourth time. The run has been sold out since the end of January; 14,200 skiers are registered. Superstar Dario Cologna has his fourth win at the Engadin Skimarathon in his sights. However, he will face a strong field of opponents on Sunday. Last year’s winner Roman Furger also wants to win the “Engadiner” for the fourth time, even though his current form makes this goal questionable. In addition to the two Swiss, the French and Scandinavians are especially likely to in the running for a victory: Maurice Manificat already has a World Cup victory this winter. Together with Clément Parisse and Adrien Backscheider, who are also competing, he won bronze at the World Championships in Seefeld this season. From the strong French team, Jules Lapierre, Jean Marc Gaillard, Robin Duvillard and Renaud Jay are also top-picks. The strong sprinter placed twice in the top five in 2017 and 2018. Also the Norwegians with Anders Gloersen (winner 2014), Tord Asle Gjerdalen and Chris Andre Jespersen are among the favorites, as well as the 2015 winner in Switzerland, Ilya Chernousov. In the women’s race, Nathalie von Siebenthal, who drew attention to herself at the World Championships in Seefeld last Saturday with her 7th place finish of 30km, is one of the favourites. Her strongest opponents include Anouk Faivre-Picon from France, who has already won the Engadiner three times, Britta Johansson Norgen, the untouched leaders of the Ski Classics, Astrid Oyre Slind from Norway and Katerina Smutna, the winner at La Diagonela this year. For the first time, the elite and elite A of the women go five minutes ahead of the strongest men. “Skiing in the sometimes very motivated men’s field means unnecessary stress for women, and it can also influence the course of the race. Also for the television viewers, the women’s race will be easier to follow.”, says Adriano Iseppi, the race director. Adriano Iseppi, Engadin Skimarathon race director. The weather forecast for the weekend is mostly cloudy with the chance of sunshine on Saturday. The night from Saturday to Sunday might bring some light snow showers with a chance of light rain. During the nights temperatures below 0 degrees are expected with plus degrees throughout the day. Yesterday, Friday Engadin valley was in bright sunshine with plus degrees. The Worldloppet Race Reporter’s opinion: The tracks will be compact and fast due to the cold nights. A little snow never hurt nobody and the fast guys in front will plow the snow for the amateur skiers, if there is any. 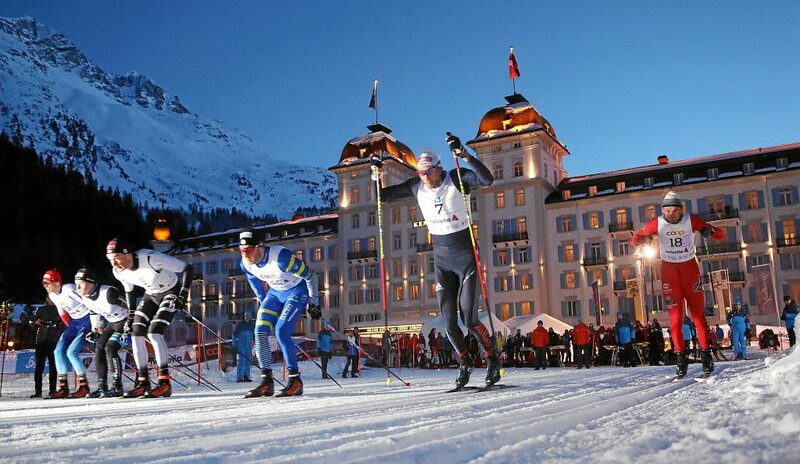 As has become tradition, two days prior to the Engadin Skimarathon, international sprinters compete at the Engadin Night Sprint in St. Moritz. Hundreds of spectators along the fast and competitive race track saw a spectacular sprint and the atmosphere was a good warm up for the marathon on Sunday. The night sprint really had it all: superb skiing, tight fights for the podium, crashes, broken poles and happy winners. Even Northug, the winner of last year’s race, had set his mind on winning the night sprint for the third time in a row. But the victory was to go to his Norwegian teammate Eivind Bakkene: in the final heat, he succeeded in grabbing the victory from Renaud Jay and Clement Arnaud from France despite their clever race tactics. Northug was left with 4th place. Janik Riebli from Switzerland, ahead of his competitors in the final heat, had to give up every hope of taking home the victory after an unfortunate fall. In the ladies’ competition, Alina Meier’s fighting spirit was undaunted. The young Swiss athlete had already had to fight her way back to the front of the group after losing a pole in the semi-finals; on the last 150 meters of the finals, she overtook the dominating Anikken Gjerde Alnaes, who had been leading the race up to that point. Fabiana Wieser (Switzerland) came in third, as she did last year.